Israeli soldiers abducted, overnight until Friday at dawn, eight Palestinians, including the head of the Jerusalem office of the Palestinian Prisoners’ Society (PPS), in several parts of the occupied West Bank, after the army invaded many communities and violently searched homes. 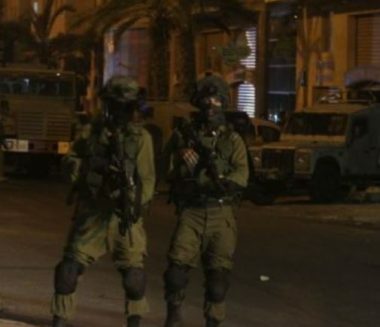 In Jenin, in northern West Bank, the soldiers invaded Burqin town, west of the city, violently searched homes, and abducted Mohammad Emad Khallouf and Abdullah Lufti Khallouf. Eyewitnesses said dozens of soldiers invaded the town, after surrounding it, while military drones flew overhead. In addition, the soldiers abducted Anas al-Bahsh, Amir al-Bahsh, Yanal al-‘Aassi and Farouq Sayyed, from Nablus, in northern West Bank, after stopping them at Za’tara military roadblock, south of Nablus. Furthermore, the soldiers abducted Shadi Mitwer, the secretary of Fateh movement in occupied Jerusalem, after invading his home in Beit Hanina neighborhood, north of the city. Also, the soldiers abducted Nasser Qous, the head of the Jerusalem office of the Palestinian Prisoners’ Society (PPS). Mofeed al-Haj, a lawyer working for the PPS in Jerusalem, said the Israeli authorities summoned Qous for interrogation at the al-Maskobiyya interrogation and detention centers, on Thursday at night, and decided to keep him under interrogation for six days. In addition, the army claimed locating a weapon in Jabal Johar area, in the southern West Bank city of Hebron. On Thursday evening, the soldiers abducted a Palestinian patient from the besieged Gaza Strip, at the Erez Crossing, near Beit Hanoun, in the northern part of the coastal region. The army also injured injured 38 Palestinians in the al-‘Ezariyya town, east of occupied East Jerusalem.